So there I was last night, rubbing shoulders with the great and the good of South-West London – well, the Lexus-buying great and the good, anyway – at the launch of the new Lexus NX hybrid SUV. Held at the impressively-positioned Lexus Twickenham, slap bang at the top of the M3 on its way into London and in the shadow of the Home of Rugby, the event combined a ‘reveal’ of the new car, a fashion show from Harvey Nichols, and generous amounts of fizzy drinks, both alcoholic and soft. It was a pretty swish event, so what was I doing there, among the Lexurati? Well, I’d been invited by Simon Byles, who runs one of London’s best and friendliest hi-fi dealers, Infidelity in Hampton Wick, just across the Thames from the shopping centre of Kingston. I seem to have driven past it almost daily for many years, but now I really can’t remember why! 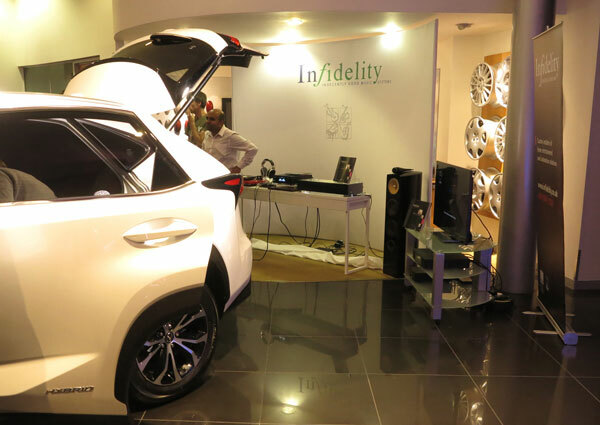 Infidelity had been invited by Lexus Twickenham to stage a display of some desirable hi-fi as part of the event and, as Simon told me, ‘We thought “Why not?”’. 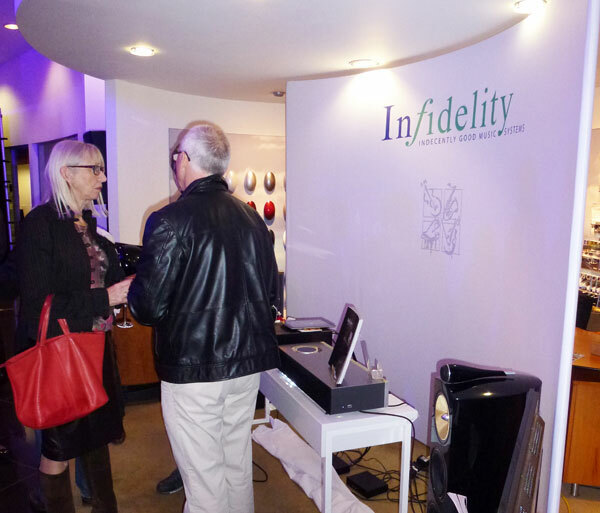 Although tucked away in a corner of the showroom usually occupying a sales desk, complete with colour swatches and wheel options on the wall, the Infidelity display looked totally in keeping with the rest of the event, even if the equipment on display was struggling at times against a PA system pumping buying-mood-enhancing music. 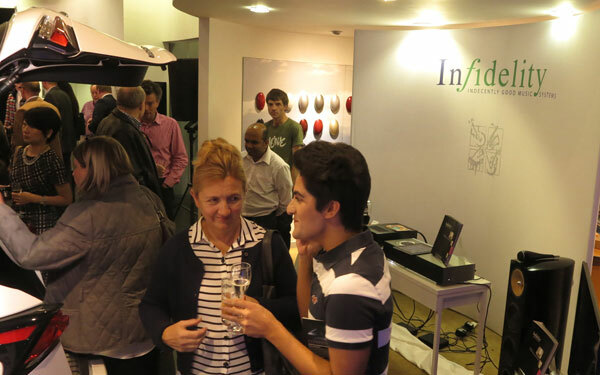 Among the choices for the show were the Oppo PM-1 headphones and HA-1 DAC/headphone amplifier, B&W speakers, a Linn multiroom demonstration and Infidelity’s mu-so by Naim demonstrator, which had arrived at the shop the same afternoon. And they were attracting plenty of interest from those there to look at the new car (although talking to Simon it seems his shop and the Lexus dealer have at least some crossover of customer-base). 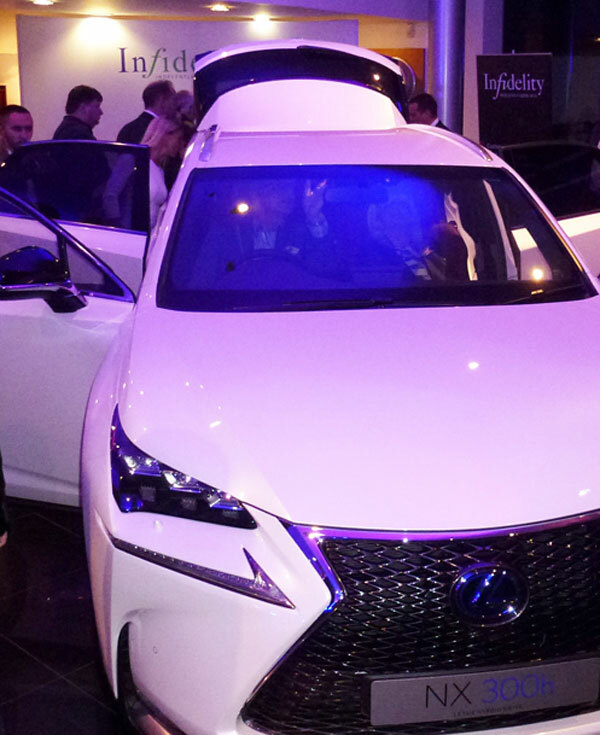 It was an interesting insight: discussing the car we were there to see launched with some other Infidelity/Lexus customers, I was interested to hear it dismissed with ‘Have you seen the size of the boot? You couldn’t get two sets of golf clubs in there!’, and agreed that such a consideration should be a pretty core design consideration given the car company’s intended customer. After all, isn’t that the Jag test? However, what was most impressive – well, apart from the car reveal, the willow-thin Harvey Nichols models (and the female ones were quite slender, too) and the buzz the event generated, was the way a hi-fi dealer was going out of the comfort zone of its usual premises, and getting amongst customers both present and (hopefully) future on their ‘home turf’. Rather like Naim with the mu-so, in fact: by making the product available through the likes of John Lewis and Richer Sounds, as well as existing dealers like Infidelity, the Salisbury company is putting its brand, and its audio expertise, in front of potential buyers who wouldn’t even know where there local hi-fi specialist was, let alone make a trip to visit it. In fact, the kind of people who’d normally go into their local B&O centre and say ‘I want music throughout my new house’ without asking (or caring) how much it’s going to cost – and yes, they do exist! At a time when so many hi-fi shops have either vanished or are staring into the abyss while blaming everything from Amazon to hi-fi companies’ diversification for their impending demise, it’s refreshing to see an enterprising retailer getting out and actually doing something about growing its customer base, as well as exposing potential customers to what good audio equipment can do in their home. Survival of the fittest? Could well be – and companies willing to go out and seize opportunities like this are likely to be the ones not just surviving, but re-growing the hi-fi industry. Surprised not to see you among the Twickenham Lexurati, JD!